Learn the truth about five common log home chinking misconceptions. 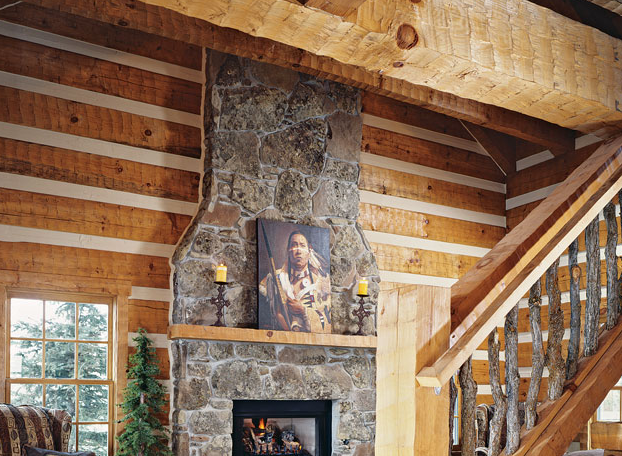 Whatever the wood species, corner profile or overall style, log homes have an unquestionably rustic look—and no element captures the pioneer spirit better than chinking. For some, it’s more aesthetic, while for others, it’s the more practical reasons (think insulation and flexibility) that lead them to incorporate chinking into their home’s design. But with chinking comes a number of myths about how, why and when it should be used. Not sure what to believe? Read on to learn the truth about five common chinking misconceptions. MYTH: Chinking only comes in white. FACT: When most people think of chinking, they think of, well, zebra stripes—bands of white material between dark logs. Actually, most manufacturers offer a variety of color options, including modern hues designed to match your logs. Looking for something totally different? Some manufacturers offer tinted products to create more vibrant color options. MYTH: Synthetic chinking can’t be applied over old mortar chinking. FACT: Today’s chinking can be applied over old mortar pretty easily. First, fill in any gaps in the mortar with a backing rod, so the rod is level with the original chinking. Next, cover the joint with bondbreaker tape and apply a full-thickness application of the new chinking, extending it 3/8 of an inch beyond both edges of the tape. FACT: There may have been some truth to this in the past, when chinking was a cement-based material with relatively low bond strength and absolutely no elasticity. But today’s materials are much more flexible, making chinking far less likely to tear or come loose from your log wall as your home settles. On average, chinking should last between 40 and 50 years. MYTH: If chinking splits or pulls away from the logs, it’s hard to fix. FACT: Sometimes there are logs that move more than others during the settling process. This is completely normal, but it can result in torn or loose chinking. (Look for this during the first two or three years after your home has been built.) If your chinking tears in the center, simply clean the area and re-apply new chinking. If it pulls away from the logs, cut out the loose sections, clean the area and re-apply. MYTH: Chinking is solely for visual appeal. FACT: If properly applied, chinking can dramatically improve a home’s energy efficiency by reducing heat loss where the logs come together. In fact, chinking can boost the Rvalue (a measure of heat transfer) of a chinked joint to almost the Rvalue at the log’s center.